I'm connected over a café WiFi and received a warning from my mobile browser. When I looked further, it seems like the certificate is only valid for one day, which seems super suspicious. It says Imgur on it, but then why is it flagged up and why is it only valid for one day? I've not found another certificate that's affected. This isn't one of Imgur certificates. Certificate Authorities must report all certificates they generate to transparency logs, which are public databases. This allows user-agents, like Chrome, to check that this certificate can be audited by the website's owner. According to the error messages, this certificate hasn't been issued by a valid certificate authority, so you can't trust the issuer. The issuer claims to be "DNSFilter". DNSFilter is a proxy used to filter requests, and it also tries to proxy HTTPS requests, so it generates a self-signed certificate for every domain. Since you can't trust the issuer, you can't be sure that the certificate comes from the real DNSFilter product. Anyone could be impersonating it. 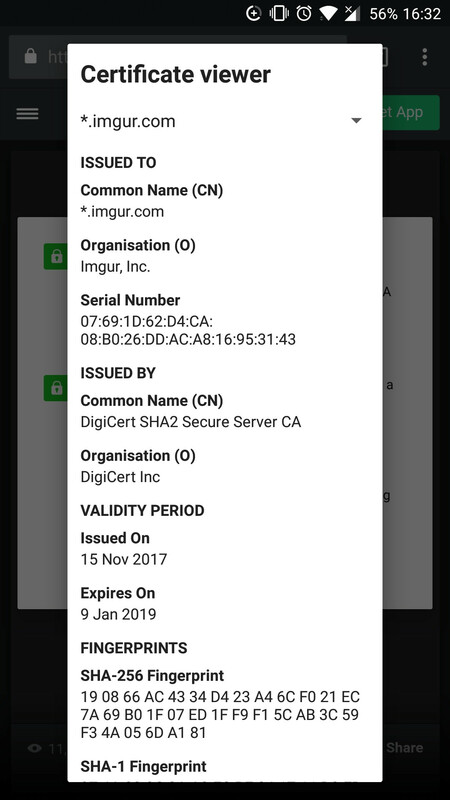 It's safe to assume that this is not a legit certificate for Imgur. The exact reason for such a short lifetime for the certificate is unknown. This is apparently an MITM attack. Someone is trying to intercept the connection. Whether it is a malicious third-party attacker or the cafe trying to filter content/insert advertisements (relatively harmless) is impossible to say for sure. While the certificate claims to be issued by DNS Filter, it is impossible to say, whether it really was. 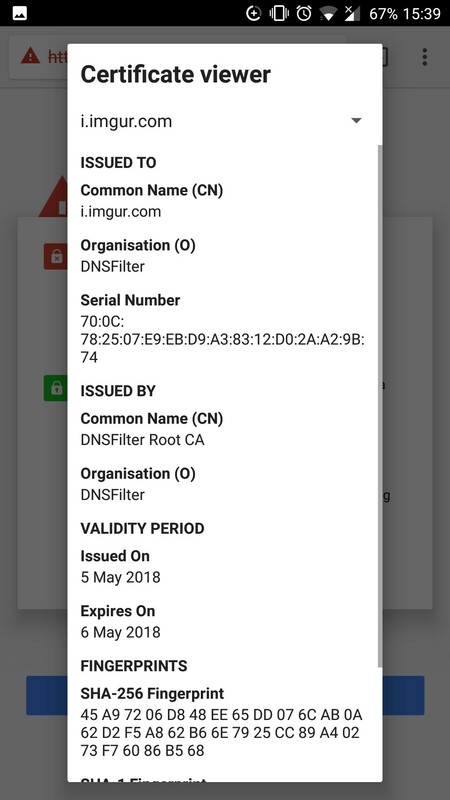 Anyone can create a certificate with the name claiming to be "DNS Filter", and the certificate is not signed by anyone, so you can't trust what it says. It may have been really created by DNS Filter, but it also could be a malicious attacker trying to gain trust by using a recognizable name. You should NOT assume it was really created by DNS Filter. 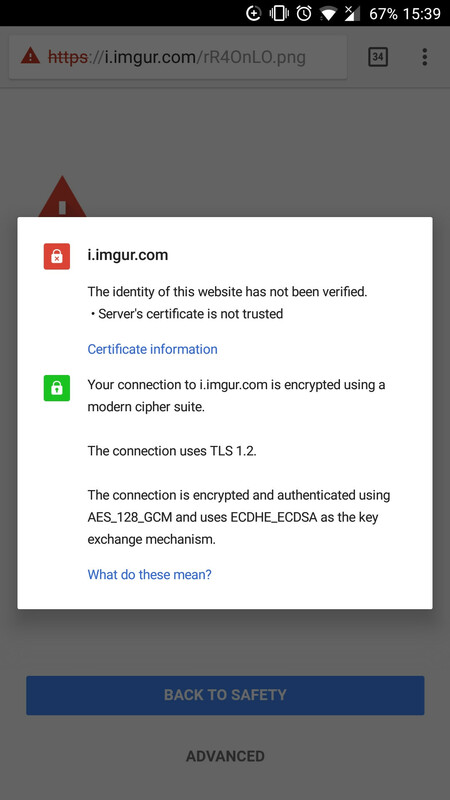 Either way, that is certainly not a genuine imgur certificate. No, it is generated on the fly by DNSFilter or an attacker pretending to be DNSFilter performing an MITM attack. As the new certificate is not trusted by your machine you get a warning. This is true in both cases, an attacker CA would be untrusted, but so would the DNSFilter CA. There are many reasons this could be, but a major one is trying to reduce the risk each individual certificate poses if it is leaked. The idea is that as long as the root cert is kept safe, then even if a site cert leaks, it is only trusted by devices that trust the CA. As the certificates are generated on the fly there is no issue with the regular re-issuance that this requires. Is SSL interception a good idea? There are some cases where it is acceptable, when absolutely necessary, but these do not apply for public WiFi, where you do not really trust the hotspot operator. Not the answer you're looking for? Browse other questions tagged certificates wifi or ask your own question. Why is this certificate valid for so many domains? Can I spoof a specific AP of a network?